JewelryCircle.com – Jewelry Circle sells 14k gold chains, omega necklaces, gold bracelets and other fine 14k gold jewelry at wholesale prices to the public. The Jewelry Circle is a wholesaler of fine 14k gold jewelry. 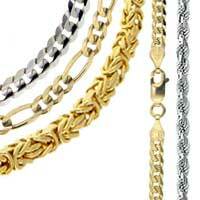 We carry a complete selection of gold chains including an extensive array of white gold chains. We also pride ourselves for carrying the highest quality and selection of omega necklaces and byzantine necklace styles in the market. Whether you are interested in purchasing a white gold chain, a white gold omega necklace, or another type of gold necklace in white gold or yellow gold, we guarantee that you will find exactly what you are looking for. 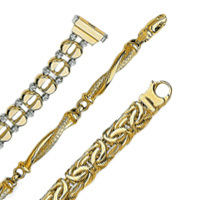 In addition to our necklaces, we carry a huge variety of gold bracelets for both men and women. You’ll also find a great selection of onyx rings and other gold rings at wholesale prices. In fact, when it comes to rings, black onyx rings are our speciality. If gold earrings are what you are looking for, you will be happy to know that we carry over 350 different styles of earrings including a large variety of hoop earrings. What about pendants? 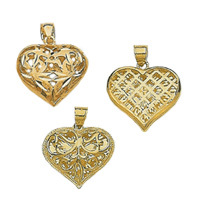 Browse through our gold crosses, gold lockets, and other beautiful gold charms and you’ll be sure the find the perfect accessory for your gold chain or charm bracelet.